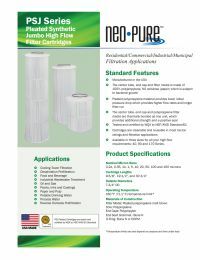 The Neo-Pure PSJ-40 Pleated Synthetic Jumbo Cartridge features pleated synthetic polypropylene filter media which allows for lower initial pressure drop and higher flow rates which means fewer cartridges to change. The PSJ Series filter's pleated surface area translates to increased filter life, higher dirt loading capacity and increased particle removal. Filter Dimensions: 9-5/8" x 7-3/4"